With a final turn of the key, the coil spring inside is wound up to the maximum. The legs have hardly touched the ground and off they run – clacking, clattering, rattling – in that pre-set rhythm in which the hidden gear wheels engage with each other. Hectic, flapping its wings, it wiggles away. This brightly coloured bug moves and makes lots of noise – there can, therefore, be no doubt: it’s alive! But its powers soon wane, its temperament visibly disappears, and the agitated creature freezes into a lifeless animal made out of metal. The first industrially produced mechanical toys were created toward the end of the 19th century. Round 1890, the novel lithographic printing made it possible to offer the previously hand-painted objects at substantially cheaper prices and in larger quantities. Their individual parts were also no longer complexly soldered but instead held together with folded metal tabs. These novel toys were not particularly sophisticated at the beginning but rather above all one thing: cheap. Penny toys were supplied in sets of sixty and were intended for mass sale. Since autos, motorcycles, and airplanes were still waiting to be invented, mechanical animals made the running before them. Beyond the mundane mass products, various manufacturers were able to establish sophisticated quality products on the international market. They produced small technical marvels on an industrial scale that could mostly brought to life by children with the help of a key. With the progressive opening up of all regions of the earth, newly discovered, foreign animal worlds aroused increasing public interest and the scandalous claims of Charles Darwin also inspired people to observe our now not so distant relatives more closely. Museums and natural history collections already then saw it as their task to communicate current findings in a scientifically based and descriptive manner. Zoological gardens also competed to outdo each other with a population of animals that was as exotic as possible. Industry and commerce also attempted to profit from the growing popularity of the animal world and thus augmented it in their own way. It is no wonder that the early product advertisements resembled a colourfully populated wildlife park in which apes promoted shoes, elephants tea, frogs shoe polish, and dogs chocolate and cigarettes. Animals were also an omnipresent theme in the collectible picture albums that were quite popular at the time. This advertising medium had significant pedagogical value since it brought together the wealth of knowledge of broad levels of the population. Against this background, it is easy to understand that producers of toys also did their utmost to conquer children’s rooms with a species-rich world of animals. In contrast to stuffed bears or rocking horses, these small tin animals, however, always seemed somewhat ungainly and peculiar both in their nature as well as in their function. It was not possible to ride them playfully nor did they find a place on the pillow at night. But when they began to move clatteringly, everyone look at them in astonishment. Curiosity, the play instinct, and joy of discovery came together in the mechanical tin animals and were combined in the best case with ingenuity and solid craftsmanship. These toys fostered a mechanical understanding of things and simultaneously demanded an adult handling of them. They required considerateness and a sure instinct even of the small child, since otherwise either the key got lost or the mechanism was overwound, and then the fun was finished. Germany developed quite early on into a stronghold of the tin toy industry. The neighbouring cities of Nuremberg and Fürth, with a wide range of producers (Issmayer, Schuco, Gama, Köhler, Arnold, etc. ), formed its centre. In the town of Brandenburg in distant Prussia, the Ernst Paul Lehmann company developed after 1888 into one of the most innovative companies in the field. Products were delivered around the world. Tin toys »Made in Germany« became known worldwide. Notwithstanding, it was also possible for leading manufactures to become established in other places, such as, for example, Louis Marx and J. Chein in the United States, Vebe and Joustra in France, and Mobo in England. During World War II, the German toy manufacturers were also drawn into production for the war effort. When it was afterwards time to clean house, the great age of tin toys seemed to have passed. In the 1950s and 1960s, tin toys, nonetheless, experienced a final great renaissance. Certainly, only a few companies managed to hold their ground against the emerging competition from Japan. At the beginning, the Japanese were skilled at copying beloved classics, but companies such as Mikuni, Modern Toys, and Yone soon created their own accents with the novel battery operation and spectacular design. This final period of prosperity was followed by a rapid decline. As colourful plastic began to dominate children’s rooms, traditional tin toys had finally had their day. Mechanical tin animals have since then been considered an endangered species. Their survival only seems to be assured in the care of committed museums and loving collectors. We went on a photo safari together and discovered the »Mechanical Animal World« for ourselves anew. The vast abundance of species and the diversity of creative forms that the tin animal has historically had instantly captivated us. We playfully placed the animals in their natural environments in order to observe them with the camera. Our journey took us to every continent – we encountered them in the indigenous forest, in the African jungle, in the Australian Outback, and at the South Pole, and also high above the clouds and on the deep seabed. When taking the photographs, we trusted in the means of staging alone and did not resort to the effective possibilities of digital image editing in any way. We believe that this was the best way to do justice to the historical animals. Each one has its own character. This is what we strive to show in our images. to different spatial conditions (from approx. 80 to 300 square meters, on tour). 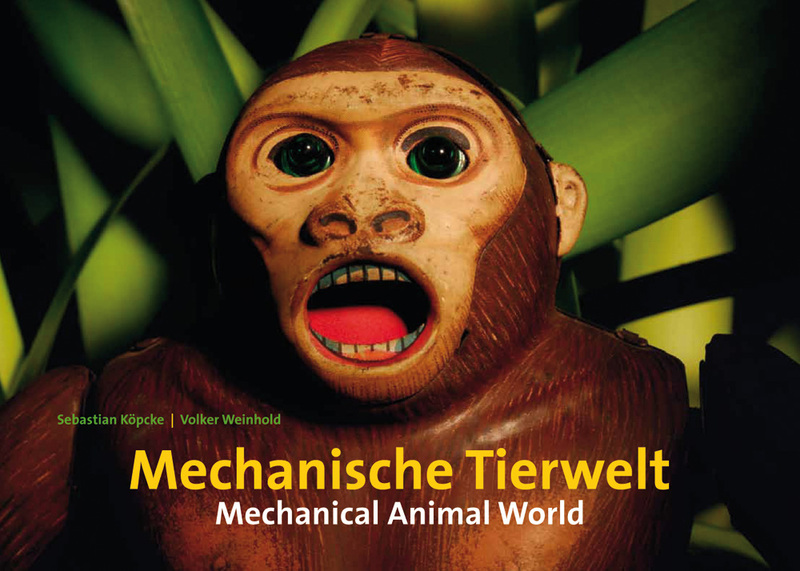 The book to the exhibition »The world of mechanical animals«, produced in cooperation with the Naturmuseum St. Gallen, presents all pictures of this extraordinary photo safari. The book containes a introductory chapter about the history of mechanical toys and a contribution »the mechanic of the living« by Dr. Toni Bürgin, director of Naturmuseum St. Gallen. Nous nous mettons au safari photographique pour découvrir « Le monde des animaux mécaniques » pour nous-même à nouveaux. La biodiversité et la diversité des formes créatives des jouets du macaron ont nous inspiré tout de suite. Du jeu, nous avons placé ces animaux dans leurs environs naturels pour les observer par camera. Notre voyage nous a mené sur chaque continent – nous les trouvons dans les forêts indigènes, la jungle africaine, les régions désertes de l’Australie et au pôle Sud, et aussi à la hauteur du ciel, sur les nuages, et à la profondeur du océan. Pendant photographier nos objets nous nous confions de nos arrangements originales comme mise en scène seulement. Ce faisant, nous renoncions à user des possibilités théâtrales du traitement d’images digitales. Nous pensons que cette façon de procéder est le moyen meilleur pour satisfaire aux formes historiques des animaux mécaniques. Chaque animal a son propre caractère. Nous voulons designer ces spécifités dans nos images. • 1 film en DVD vidéo (HD, environ 10 minutes) qui présente 43 animaux mécaniques en fonction avec leurs mouvements individuelles et caractéristiques. L’exposition « Le monde des animaux mécaniques » qui est compté pour une exposition itinérante peut être adapté aux réalités spatiales différentes (de 80 à 300 mètres carrés). La livre à l’exposition est bilingue : Les explications concernant des photos inclus sont en allemand et en anglais (pour gagner de plus belle information en détail confer aux textes sur les points « Mechanische Tierwelt / Das Buch » ou sur le point « ENGLISH » s. v. p.). S. Köpcke, V. Weinhold: Mechanische Tierwelt / Mechanical Animal World ((Éditeur T. Bürgin, Naturmuseum St. Gallen (Suisse), ISBN 978-3-00-034781-8), Livre relié, 96 pages, 99 images.